Submitted by Taps Coogan on the 23rd of February 2018 to The Sounding Line. For every American 65 years of age or older, there are now barely three people working and paying into the country’s safety-net, Social Security, and Medicare programs. In France there are barely two workers per senior. In Japan there are slightly less than two. In Italy and Greece there are barely more than 1.5 workers per senior, less than half the ratio in the 1960s. In each case, the definition of a ‘worker’ includes anyone working as little as one hour a week. 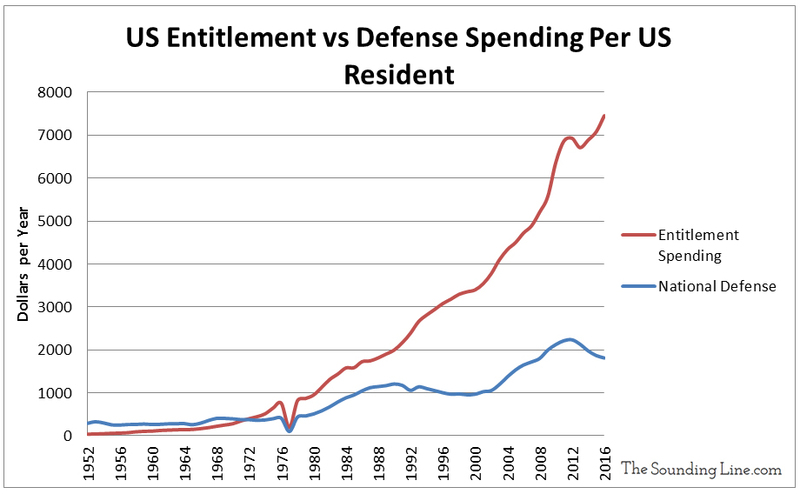 At the same time, government entitlement spending is surging in virtually every developed economy. In the US, a full 73% of government revenues are already being spent on entitlement programs and over 60% of those entitlements go to senior citizens via Social Security and Medicare. 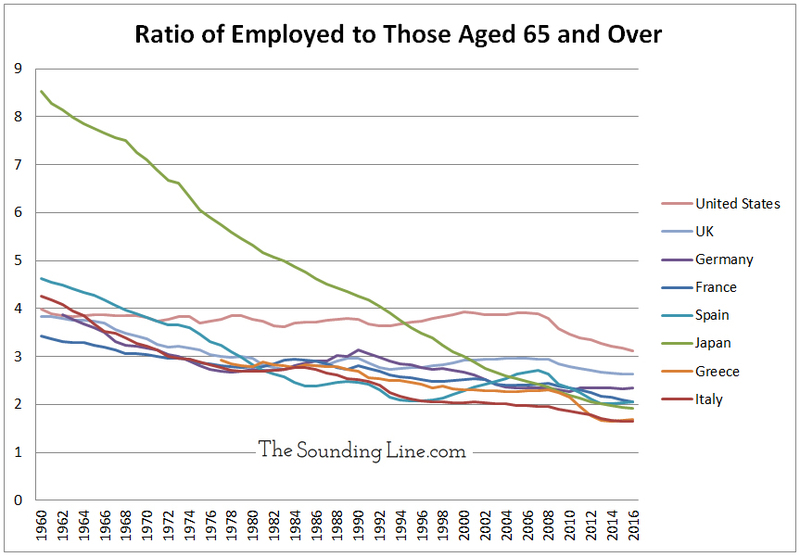 With the bulk of the baby-boomer generation reaching retirement age right now, the problem is only going to get worse. With fewer and fewer workers per retiree, with entitlement spending already consuming the vast majority of tax revenues across the developed world, with governments already running large perennial deficits, with most developed world governments already weighted down with over 100% debt-to-GDP, and with interest rates set to rise, there is a funding crisis coming to governments across the developed world. In many of these same countries, whatever tax revenue is not being spent on entitlement programs is already being spent servicing huge national debts. The time to balance government budgets is now. The beneficiaries are the ones who have paid for the benefits so there shouldn’t be an issue. Given that most of the big programs (Social Security in the US etc) are ‘pay as you go’, this is exactly why there is an issue.